OK, I’ll admit it… God doesn’t always act the way I expect Him to. His timing can be wonderful and it can be extremely frustrating! It seems to me that in the kingdom of God there’s a lot of waiting and a fair amount of suddenly. And the suddenly-stuff would often fit in neatly under the heading of not-quite-what-I-expected. We often expect our progress towards the things God has promised us to be step by step in a straightforward direction, like the pawn on a chessboard. But perhaps it’s more normal to be a bishop! The pieces on a chess board each have their own unique way of moving. 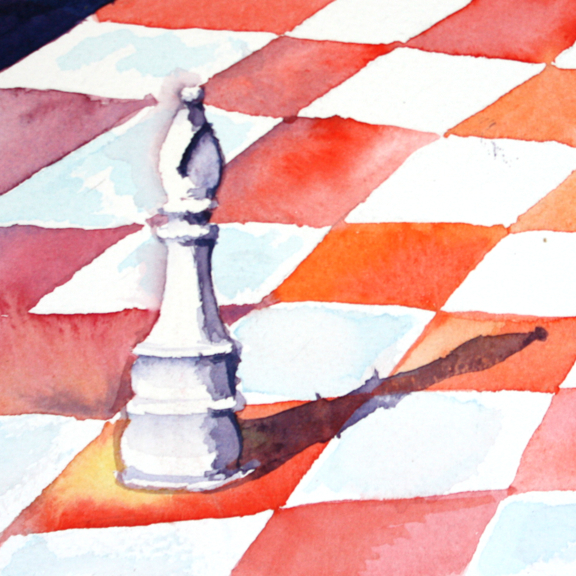 The pawns mostly move one step at a time, forwards. The bishops on the other hand can move right across the board (diagonally) in one move. They often spend most of the early part of the game not moving, but can go from hiding at the back to the thick of the battle in an instant – suddenly. So I’ve painted a chess-bishop this week for all those sitting on the back row wondering when God will use them and how. And for those who have heard God’s call on their life to do something, and yearn for a step-by-step obvious route to get there, but don’t see the ‘pieces’ neatly falling into place. The line marks the moment when Joseph, alone in the prison, is about to be asked to interpret Pharaoh’s dream. It’s the big turning point in the story: It looks as though Joseph is as far as he can be from the promises that God gave him and yet there is barely time for a shave and change of clothes before he stands before Pharaoh interpreting his dream. In a matter of hours Joseph goes from prison to power, from hopelessness to walking out into the promise God had given him all those years before. Joseph had years and years of waiting and then a ‘suddenly’. I hate waiting. Patience is a fruit I’m yet to grow much of. But I know that I shouldn’t abandon his promises for me and my family just because His timing is not what I’d expected. So, when I am trying to work out how God could possibly give me the things I have heard Him whisper, I’m learning to remember that it may not be step-by-step in a straight line that I get there. If you’d like to take this further, why not meditate on and pray through Psalm 40 1:3. Or write down in your journal some of the things God has promised you, but that you’re not walking in yet and ask God to help you to wait for them with faith. I really like your chess board metaphor. And it reminds me of that verse, ‘Blessed are the pawns for theirs is the kingdom of heaven.’ At least, I think that’s how it goes.